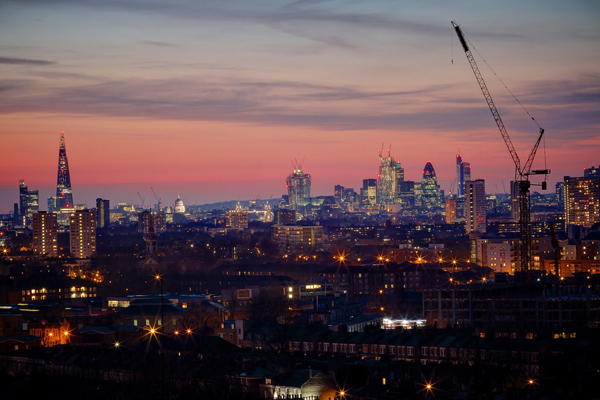 Another of London’s protected views, though perhaps lesser known, is the panoramic vista from the top of Point Hill in Blackheath towards the City. The view from a small park known as The Point (reached via Point Hill, just to the west of Blackheath) takes in modern City skyscrapers as well as Tower Bridge, St Paul’s Cathedral and even the dome of the Old Bailey. While there is a danger the growth of plants along the brow of the hill can partially block the view (which stretches as far as Essex), it remains a splendid site from which to view the city and no doubt was a vantage point for those, such as the leaders of the Peasant’s Revolt of 1381, who historically gathered on Blackheath before marching to London. The park, meanwhile, is host to a memorial stone erected to mark the site where an Australian-born RAF pilot, Flight Lieutenant Richard Carew Reynell, fell to his death on 7th September, 1940, after his Hurricane fighter was shot down over Blackheath on the first day of the Blitz. 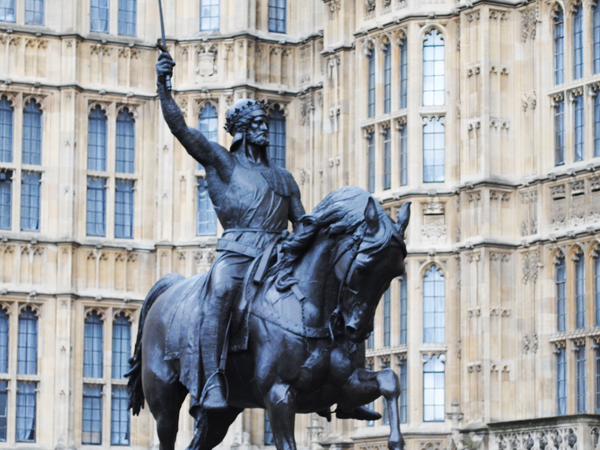 Located in Old Palace Yard outside the Palace of Westminster, this Grade II-listed equestrian statue of 12th century crusader-monarch King Richard I, known as the “Lionheart” or Coeur de Lion, is the work of 19th century sculptor Baron Carlo Marochetti. 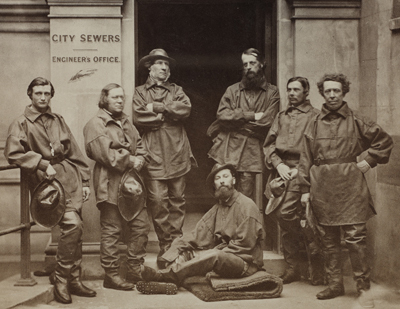 The nine metre high statue was originally exhibited as a clay work at the Great Exhibition of 1851 – it was located outside the west entrance of the Crystal Palace – and, despite the tail falling off soon after it was display, it was well enough received by the crowds attending the exhibition (as well as the critics) that a public subscription was raised to cast the statue in bronze. Queen Victoria and Prince Albert were among those who subscribed. It was initially proposed that the statue be placed on the site of the Crystal Palace as a memorial to the exhibition (along with a statue of Prince Albert), but this plan was put aside and, after numerous other sites were considered, the current location was settled on. The statue was erected on the site, facing south, in 1860, although it wasn’t completed with the addition of two bronze bas relief panels until 1867. These depict Richard on his death bed pardoning Bertran de Born, the archer whose arrow caused his death, and Richard fighting Saracens at Ascalon during his crusade in the Holy Land. Two other proposed panels were never made. The statue was peppered with shrapnel when a bomb landed only a few metres away in 1940 during the Blitz, leaving Richard’s sword bent and damaging the tail and granite pedestal. The sword was fixed soon after. Further conservation works were carried out in 2009. Italian-born Marochetti had worked in Paris as a sculptor before following King Louis-Philippe to London after the revolution of 1848 and largely remained in the city until his death in 1867. He was created a baron by the King of Sardinia. 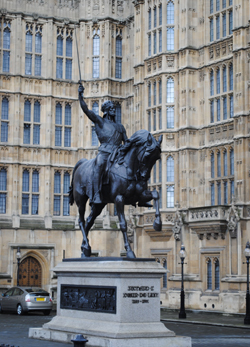 His statue of Richard is one of few artworks created by non-British artists in the Parliamentary estate and while Marochetti had plans to create another equestrian statue, this one of Edward, the Black Prince, to face his statue of Richard across the entrance to the House of Lords, it never eventuated. Plans to install the second statue are, however, once more being talked about. 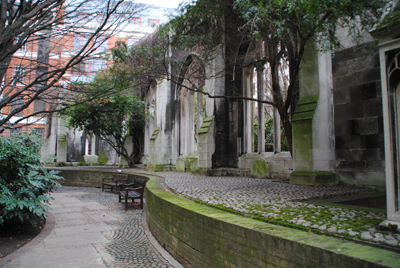 Located amid the remains of the medieval church of St Dunstan in the East, the garden was created in the late 1960s after the church was finally – and irrevocably, apparently – destroyed in the Blitz of World War II. The church’s origins went back to around 1100 and it was subsequently extended with a new south aisle in the late 14th century and repaired in the early 17th century before being severely damaged in the Great Fire of 1666. Patched up, with a new steeple and tower added to the building between 1695-1701 by Sir Christopher Wren, the building stood until the early 19th century when much of the church – with the exception of Wren’s additions – had to be rebuilt (for more on the history of the church, see our earlier Lost London post here). The ‘new’ building was, however, badly damaged during bombing in 1941 and it was decided not to rebuild the church in the aftermath of the war. The City of London opened a garden, sympathetic with the remains of the Grade I-listed building, on the site in 1971 (although Wren’s tower remains). They won a landscape award only a few years later. Features in these atmospheric gardens – which seem to capture the essence of the Romantic idea of what ruins should look like – include a fountain which sits in the middle of the nave. In 2010 it was one of five public gardens in the City where award-winning ‘insect hotels’ were installed. Maintenance works were carried out in 2015 and new plantings put in (the picture, above, was taken before this). This church in the shadow of 30 St Mary Axe (aka The Gherkin) is all that remains of a Benedictine nunnery that was founded here during the reign of King John in 1210. Established by one “William, son of William the goldsmith” after he was granted the right by the Dean and Chapter of St Paul’s Cathedral, the priory was built to the north of a previously existing church with a new church for the nuns to use built right alongside the existing structure (thus accounting for the rarely seen side-by-side naves of the current building). While the new church was built longer than the existing church, the latter was then lengthened to give them both the same length. 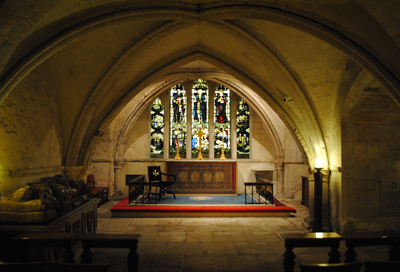 A line of arches and a screen separated the nun’s choir and the parish church. The church which stands today has been much altered over the centuries and what we now see there largely dates from the 14th and 15th centuries (although the bell turret which sits over the west front is an 18th century addition). One of the priory’s claims to fame in medieval times was that it apparently was once home to a piece of the True Cross, presented by King Edward I in 1285. The nunnery was dissolved in 1538 during the Great Dissolution of King Henry VIII and the buildings, excepting the church, sold off to the Leathersellers’ Company (all were eventually demolished by the 18th century). The screen separating the nun’s choir and the parish church, meanwhile, was removed, leaving the main body of the church as it can be seen today. 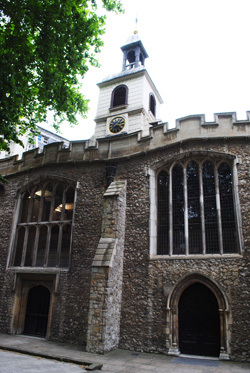 The now Grade I-listed church, which was William Shakespeare’s parish church when he lived in the area in the 1590s, survived both the Great Fire of London and the Blitz but was severely damaged by two IRA bombs in the early 1990s leading to some major – and controversial – works under the direction of architect Quinlan Terry. Inside the church today is a somewhat spectacular collection of pre-Great Fire monuments including the 1579 tomb of Sir Thomas Gresham, founder of the Royal Exchange, the 1636 tomb of judge, MP and Chancellor of the Exchequer, Sir Julius Caesar Adelmare, and the 1476 tomb of merchant, diplomat, City of London alderman and MP, Sir John Crosby. It was also once the site of the grave of 17th century scientist Sir Robert Hooke but these were apparently removed from the church crypt in the 19th century when repairs to the floor of the nave were being made and placed in an unmarked common grave. Their location apparently remains unknown. WHERE: St Helen’s Bishopsgate, Great St Helens (nearest Tube stations are Aldgate, Bank and Liverpool Street); WHEN: 9.30am to 12.30pm weekdays daily (also usually open Monday, Wednesday and Friday afternoons but visitors are advised to telephone first); COST: Free; WEBSITE: www.st-helens.org.uk. 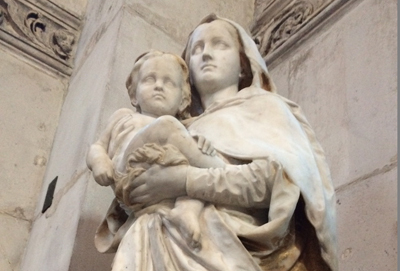 This Victorian-era marble statue of the Virgin and Child has gone back on show in St Paul’s Cathedral more than 70 years after it taken down following bombing during World War II. Part of an ornate high altar and reredos installed at the cathedral’s east end in 1888, the statue – the work of Thomas Garner – was put into storage after that part of the cathedral took a direct hit during the Blitz of 1940 and what remained of the altar was dismantled (the statue and a crucifix were the only parts retained by the cathedral). It can now be seen in the Chapel of St Erkenwald and St Ethelburga (also known as the Middlesex Chapel) in the north transept. For more, see www.stpauls.co.uk. PICTURE: The Chapter of St Paul’s Cathedral. 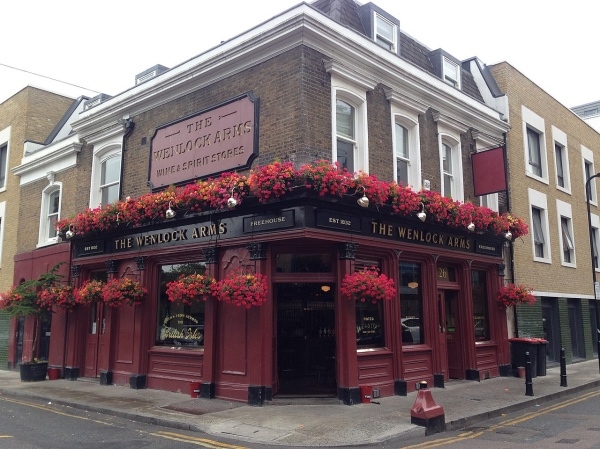 This pub, located just off Charterhouse Square near Barbican, has a distinctive barrel-shaped front window and a name that evokes a sense of the rich history of the area in which it stands. 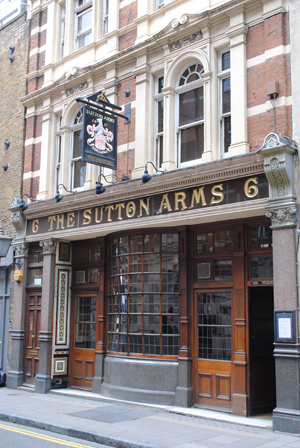 The name of this pub at 6 Carthusian Street comes directly from Sir Thomas Sutton, a late 16th century/early 17th century businessman and moneylender who owned nearby land on which a Carthusian monastery once stood and who founded the Charterhouse School based at the site. The monastery, which had been founded in 1371, was dissolved by King Henry VIII in the Dissolution of the Monasteries which took place in the first half of the 16th century – it was a nasty business with some of the monks executed at Tyburn. The land was subsequently granted to Sir Edward North who built a mansion on the site which was subsequently sold to the fourth Duke of Norfolk. It was his son, Thomas Howard – the first Earl of Suffolk, who, in 1611, sold the property to Sir Thomas (and subsequently built the magnificent Audley End House in Essex with the funds). 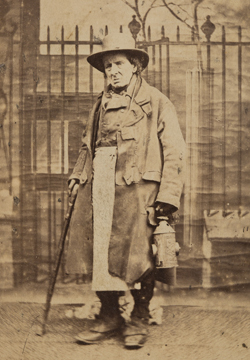 Said to have been the “wealthiest commoner in England”, Sutton, who died that same year, used his wealth to endow a charitable foundation to both educate boys and care for elderly men. The Charterhouse school later moved out to Surrey while elderly “brothers” are still housed at the original location today (for more on the Charterhouse, see our previous posts on King James I’s London and on 10 Historic London Squares). Some of the glass in the pub’s great barrel-shaped window was apparently replaced after a bomb knocked some of the original out during the Blitz. Incidentally, there’s another pub of the same name only a few streets away in Great Sutton Street. The ruins of this medieval church can still be found in the eastern end of the City of London and now play host to a rather delightful little park. 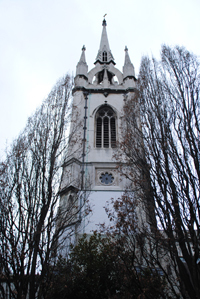 Originally built around 1,100 in the Gothic style, the church – which stands between St Dunstan’s Hill and Idol Lane (off Great Tower Street) was enlarged and repaired in ensuing centuries before suffering severe damage in the Great Fire of London in 1666. Not enough to destroy the church, however, and it was repaired in the late 1660s with a new steeple and tower designed by Sir Christopher Wren to fit with the existing structure, was added in the late 1690s. Inside were carvings by Grinling Gibbons. But by the early 19th century, however, the weight of the roof had pushed the walls dramatically out of line and, after an unsuccessful attempt to repair the church, it was decided to demolish it (with the exception of Wren’s tower) and rebuild. Built in the Perpendicular style to the designs of David Laing, the new church reopened in 1821. The church lasted for more than 100 years before it was again severely damaged, this time during the Blitz of 1941. Wren’s spire and tower thankfully remained but other than that it was a shell with only the north and south walls remaining. The Anglican Church decided not to rebuild – the parish was incorporated into that of All Hallows by the Tower – and the City of London Corporation opted to turn the (now) Grade I-Iisted remains into a public park. It was opened in 1971 by the then Lord Mayor of London, Sir Peter Studd. It remains there today, with beautiful climbing foliage – including many exotic plants – and a fountain in the nave. The tower, meanwhile, is used by a complementary medical centre. A great place to pass a lunch hour! Seventy-one years of broadcasting from Bush House in Aldwych came to an end last week when the BBC World Service formally left the building. The building has been used by the BBC for foreign language broadcasting since 1941 (the service’s previous home, Broadcasting House in Portland Place having been bombed out), initially for the European Service and, since 1958, for the rest of what was then called the Overseas Service. Designed by American architect Harvey Corbett, the building at the end of Kingsway in west London was constructed in 1923 and opened in 1925 (additions were made in 1928 and 1935). Built for an Anglo-American trading company at the enormous cost of around £2 million (a price tag which led to it being declared the most expensive building in the world), it was named for American businessman, Irving T. Bush. Noted for its distinctive portico featuring two male statues depicting Anglo-American friendship, the premises has been the site of important events including General Charles De Gaulle’s wartime broadcasts to the Free French while among those who worked in the building were George Orwell, who worked for the Eastern Service during World War II. The BBC, who have returned the World Service to Broadcasting House following a major extension, have never actually owned the building – owners during its residency there have included the Church of Wales and its current Japanese owners. For more on Bush House and its BBC connections, see www.bbc.co.uk/historyofthebbc/collections/buildings/bush_house.shtml. For the final broadcast, see www.bbc.co.uk/news/entertainment-arts-18805063. 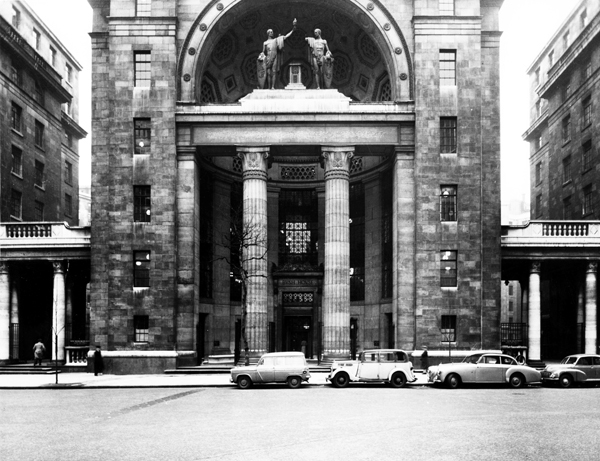 PICTURE: Bush House, 1951 – Courtesy BBC.